Earn up to 5,475 reward points. 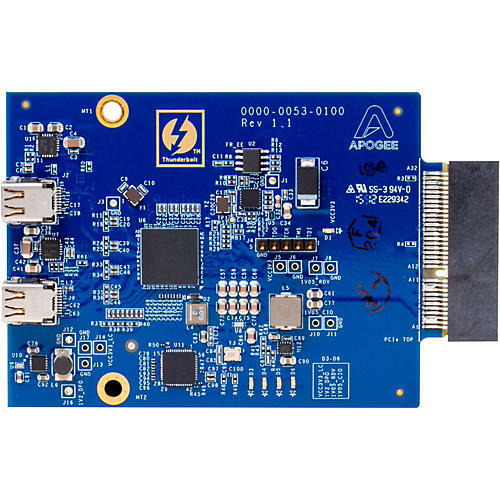 Optional expansion card for the Apogee Symphony I/O MkII. Symphony’s I/O modules are designed to future-proof your investment in flagship Apogee sound quality. If you own an original Symphony I/O, the Symphony I/O Mk II chassis can increase the longevity of your system by offering backwards compatibility with first generation 2×6, 8×8, 16×16 and 8 channel mic preamp I/O modules. Symphony I/O Mk II Thunderbolt relies on Apogee’s proprietary Thunderbolt driver, written from the ground up to offer unmatched performance and efficiency. When using Logic Pro X, latency has been reduced to an astounding 1.35 ms round-trip, allowing you to monitor through your DAW, plug-ins included, simplifying your workflow and leveraging the power of your Mac. Even when your session’s DSP demands require a higher buffer setting, Symphony I/O’s ultra-low latency means no longer having to choose between power and speed.